My ladies and gents, this weekend is Labour Day weekend. Now, for most of us crazed soca lovers, that means people from all over are packing up a car, a suitcase or an overnight bag to find themselves in New York City on the Parkway. However, there are plenty of things going on this weekend for those who prefer not to jump and carry on with the revelers. Perhaps you prefer to get your date on and maybe get yourself a little lucky for the weekend. 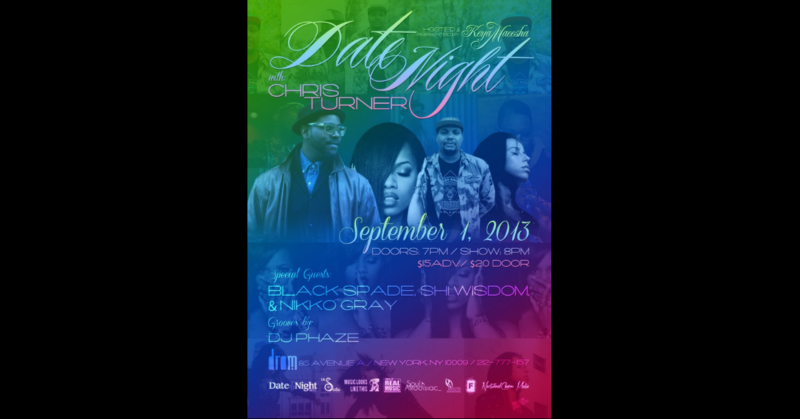 My girl Keya Maeesha has another fantastic line up in store for you at Drom on September 1st that will be sure to leave you sensually satisfied and prepared for the next installment of Date Night. This round, the evening is being set to the tone of Chris Turner, with special guests Shi Wisdom, Black Spade and Nikko Gray. Talk about sensuality and trouble to the tenth degree. And guess who has the aural stimulation on lock? None other than my radio show DJ extraordinaire Mr. DJ PHAZE himself! What a feast of sounds to take in. And to go along with that, Keya and DJ PHAZE have a wicked mixtape to get your aural stimulation prepared for what’s on the horizon. – The contest starts now, as of this post! The deadline for entries will be on Thursday, August 29th at midnight. – The winner will be notified by email and text message on Friday, August 30th, 2013.